Cancer drug companies have been fighting lately in a completely different and interesting arena: immunotherapy. The competition is indeed heating up that firms such as AstraZeneca are willing to pay millions of dollars for promising treatments. AstraZeneca, through its research company called MedImmune, has just recently announced its decision to purchase a novel drug INO-3112 from Inovio, based in Pennsylvania, for a staggering price tag of $727 million. INO-3112 is a drug for immunotherapy, a new way of combating cancer by boosting the body’s immune system. This then allows the antibodies and specific cells to fight off the tumor. The treatment may also provide synthetic proteins to boost the body’s fighting chance. MedImmune believes that with the proper immunotherapy protocol for the patient, conventional methods such as chemotherapy and radiotherapy, which have plenty of serious risks, can now be significantly reduced, if not eliminated. In fact, patients may no longer have to go through surgery, which is a common first-line treatment. While AstraZeneca already has immunotherapy products in the market, the acquisition of INO-3112 will make it an instrument for combination therapies. As for Inovio, the drug, which is still not approved, is currently in the advanced stages of the clinical trials. It will be intended for treating head and neck cancers, as well as cervical cancer. While there are already cervical cancer vaccines, they cite the rather poor record of them. Their drug, on the other hand, will work on modifying DNA sequencing that will trigger the manufacture of certain T-cells, which will then curb tumor growth. So far, MedImmune has already paid its down payment of $27.5 million. The remaining amount will be given as the research and drug reach certain milestones. The company will also pay for the research. The partnership is also set to increase the revenues of Inovio as it receives a share in the drug’s sale. Both will also be working on cancer vaccines. Another prognostic tool may be in the offing for clinicians to use in evaluating patients with oropharyngeal cancers, new research suggests. The presence in serum of three antibodies to human papillomavirus type 16 (HPV16) was predictive of better progression-free and overall survival in these patients, according to Kristina R. Dahlstrom, PhD, from the University of Texas MD Anderson Cancer Center, in Houston, and colleagues. Patients whose serum was positive for the presence of three specific antibodies to “early” (E) proteins involved in replication and growth of HPV16 had dramatically better rates of overall survival (OS) and progression-free survival (PFS) compared with patients whose serum was negative for the antibodies, they reported online June 15 in Clinical Cancer Research. Specifically, for those patients whose serum was positive for any E antibodies, 5-year estimated OS was 87.4%, compared with 42.2% for patients whose sereum was negative for all E antibodies (P < .001). The respective 5-year PFS rates were 82.9% and 46.1% (P < .001). “These results hint at a prognostic stratification of patients with HPV-related oropharynx cancer reflecting humoral immune response to HPV type 16 E proteins and thus may help in choosing immunotherapy approaches for such patients in future,” said senior author Erich M. Sturgis, MD, MPH, a surgeon at MD Anderson, in comments to Medscape Medical News. Currently, the serology results are not strong enough to be used as clinical decision tools for choosing current therapies, she added. Their findings also suggest that vaccine-based immunotherapy targeted against HPV16 E-antigens combined with other immunotherapies such as checkpoint inhibitors might be effective against recurrent or metastatic HPV16-positive cancers of the oral cavity and pharynx, said Dr Sturgis. The findings appear to further illuminate what is going on immunologically in these patients, said an expert not involved with the research. “This is certainly an interesting study that builds upon our early understanding of the role of the host’s immune response in determining outcomes in HPV-associated oropharynx cancers,” commented Lori J Wirth, MD, a head and neck cancer specialist at the Massachusetts General Hospital Cancer Center, in Boston. “We know from responses experienced by HPV-positive oropharyngeal squamous cell carcinoma patients enrolled in early clinical trials investigating checkpoint inhibitors that the host immune system can be exploited for a therapeutic end. The more we know about the host immune response to this virally mediated cancer, the better we’ll get at taking advantage of it,” she told Medscape Medical News. Earlier studies have shown that although the incidence of HPV-related head and neck cancers is rising, patients with oropharyngeal squamous cell carcinomas positive for HPV16 have significantly better prognoses than patients with the same cancers not related to HPV infections. To see whether they could identify prognostic biomarkers in patients with HPV-related oropharyngeal cancers, the investigators used enzyme-linked immunosorbent assasy to quantify immunoglobulin G antibodies to both early antigens (E1 and E4-E7) to the viral capsid proteins L1 and L2, and to the N-terminal and C-terminal fragments of E2 (NE2, CE2). Among serum samples taken from 209 patients with oropharyngeal cancers at diagnosis, at the end of treatment, and during follow-up, PFS was significantly better for patients testing positive for any E antigen (P < .001), but not for patients testing positive for any L antigen. Therefore, for all subsequent analyses, the investigators focused only on patients testing positive for E antigens. In multivariable models adjusted for age, smoking status, and treatment, the hazard ratio (HR) for death for patients with any E antibodies was 0.20 (95% confidence interval [CI], 0.1 – 0.4). The HR for progression for those with any E antibodies was 0.20; (95% CI, 0.1 – 0.5). The investigators also found that serum positivity for NE2, E1, and E6 were were all strongly associated with better OS and PFS, with respective HRs of 0.20, 0.30, and 0.30 (all significant, as shown by 95% CI). “Specific antibody status has the potential to be a useful prognostic indicator that may identify subsets of patients diagnosed with HPV16-positive tumors who may benefit from altered monitoring and/or treatments. In addition, the suggestion that immune response to HPV16 antigens is important to cancer outcomes suggests the potential of augmenting immune responses to improve treatment of patients with HPV-driven oropharyngeal carcinoma,” the investigators write. The study was supported by grants from the National Institutes of Health. Dr Sturgis and Dr Wirth have reported no relevant financial relationships. The immunotherapy Keytruda (pembrolizumab), in a recent study, proved twice as effective for the treatment of head and neck cancer as Erbitux (cetuximab), the only targeted therapy indicated as a therapy for the disease. The multisite study offers the largest experience to date of how immunotherapy can be deployed in patients with head and neck cancer, and could change the way the disease is treated. The findings were announced May 29 during the annual meeting of the American Society of Clinical Oncology, a gathering of nearly 30,000 oncology professionals taking place in Chicago. Keytruda is an antibody designed to disable the protein PD-1 so it cannot do its job of keeping the immune system in check; this allows T cells to become more active in recognizing and fighting cancer cells. In the study, investigators found that the drug produced broad and durable responses in patients with advanced head and neck cancer. Fifty-six percent of patients in the study experienced some tumor shrinkage with Keytruda, and 86 percent of those patients continued to respond to treatment at data cutoff on March 23, 2015. Keytruda produced an overall response rate (ORR) of 25 percent, and it proved active in both HPV (human papillomavirus)-positive and HPV-negative patients. Recurrent/metastatic head and neck squamous cell carcinoma (HNSCC) has a poor prognosis with a median overall survival (OS) of 13 months in patients treated in the first-line setting, and six months in previously treated patients. Previously treated patients made up the majority of the population of the study, which built on earlier findings from the KEYNOTE-012 study (NCT01848834). In that study, Keytruda — administered at 10 mg/kg every two weeks — had a 20 percent response rate in patients with advanced HNSCC whose tumors were positive for the protein PD-L1. Eligible patients had measureable disease based on RECIST 1.1 response evaluation criteria and an ECOG performance status of 0 or 1. The majority of enrollees were male (83 percent), and 56.8 percent had received two or more lines of therapy for disease recurrence. Radiographic imaging was used to assess tumor response every eight weeks. Patients were treated as long as they didn’t show progression of disease or as long as they demonstrated clinical improvement, Seiwert explained. Of 117 evaluable patients, 29 (24.8 percent; [95 percent confidence interval (CI), 17.3–33.6]) responded to treatment with Keytruda. For patients with HPV-positive HNSCC, the ORR was 20.6 percent, and in the HPV-negative cohort, ORR was 27.2 percent. Moreover, he said, about two-thirds of patients had received two or more prior lines of therapy, which generally is an indicator of a very poor prognosis. For the 56 percent of patients whose tumors decreased in size, Seiwert said the responses often occurred early at eight or 16 weeks, although there were a few outliers with late responses. “Importantly, those patients who did respond oftentimes continued to have responses — 86 percent of patients had durable responses in this cohort,” he continued, adding that not only are responders remaining on the therapy, but so are many patients who have stable disease, with a total of 40 patients staying on the drug. Serious side effects were reported in fewer than 10 percent of patients. The most common side effects were fatigue (15.2 percent of patients), hypothyroidism (9.1 percent), and decreased appetite and rash, each occurring in 7.6 percent of patients. Four patients discontinued treatment due to immune-related side effects: two due to grade 2 interstitial lung disease and grade 3 colitis, respectively, and two patients for grade 3 pneumonitis. Analysis of the findings based on biomarker status is ongoing, and Seiwert is hopeful that with the emergence of new potential biomarkers, researchers will be able to pinpoint which patients with HNSCC are most likely to benefit from the immunotherapy. For example, another related study that Seiwert and colleagues are reporting at ASCO (abstract 6017) has shown that the expression of the gene signature interferon-gamma in head and neck tumors had a very strong negative predictive value of response to Keytruda. “In the future, these results may help us, if validated, to determine which patients should or should not [be given] pembrolizumab,” Seiwert said. Pembrolizumab versus standard treatment for HNSCC also is being evaluated in two phase 3 trials that are currently recruiting participants (NCT02252042 and NCT02358031). Pembrolizumab immunotherapy is effective for patients with recurrent or metastatic squamous cell carcinoma of the head and neck (SCCHN), results of the KEYNOTE-012 trial presented at the 2015 American Society of Clinical Oncology (ASCO) Annual Meeting have shown. At a fixed dose of 200 mg intravenously every 3 weeks, pembrolizumab “was well tolerated and demonstrated a clinically meaningful overall response rate of 24.8% in patients with recurrent/metastatic SCCHN,” reported Tanguy Y. Seiwert, MD, an assistant professor of medicine, and associate HNC program leader at The University of Chicago in Chicago, IL. However, “it is important to note that response rate may underestimate the rate of benefit in patients, and ultimately we need to assess survival,” said Dr. Seiwert in an ASCO press release. Pembrolizumab (MK-3475), a humanized monoclonal antibody that blocks interaction of PD-1 with its ligands, PD-L1 and PD-L2, promotes activity of tumor-specific effector T cells. Previously, the KEYNOTE 012 study had demonstrated clinical activity of pembrolizumab 10 mg/kg every 2 weeks in patients with recurrent/metastatic SCCHN enriched for PD-L1–positive tumors. Response rate was 20%. Dr. Seiwert reported on the study’s larger SCCHN expansion cohort, irrespective of PD-L1 expression or HPV status, using a 3-weekly fixed dose. The primary end point was overall response rate per investigator assessment (RECIST 1.1). Secondary objectives included progression-free survival and overall survival. A total of 132 patients with recurrent/metastatic SCCHN were enrolled and evaluated every 8 weeks with radiographic imaging. Mean age was 60 years, 83.3% were male, and 37.9% had 3 or more lines of therapy for recurrent disease. At a median follow-up of 5.7 months (range: 0.2-8.7 months), the overall response rate was 24.8%, with 7 of the 34 patients who were HPV-positive and 22 of the 81 patients who were HPV-negative responding. Among all responders, there was one complete response and 26 partial responses. Median time to response was 9.0 weeks (range: 7.6-18 weeks). Median duration of response was not reached, he said. A total of 40 patients remain on therapy, and 86% of responding patients (25 of 29) remain in response. Drug-related adverse events (AEs) of any grade occurred in 59.8% of all enrolled patients; drug-related grade 3 or higher AEs occurred in 9.8% of patients. The most common drug-related AEs (≥5%) of any grade were fatigue (15.2%), hypothyroidism (9.1%), decreased appetite (7.6%), rash (7.6%), dry skin (6.8%), pyrexia (6.8%), arthralgia (5.3%), nausea (5.3%), and decrease in weight (5.3%). “This is yet another exciting example where PD-1 immunotherapy might work better and more reliably than existing drugs, and with fewer side effects,” said ASCO Expert Gregory A. Masters, MD, in a press release. Pembrolizumab is currently being evaluated in two phase 3 trials to investigate its clinical benefit compared with standard of care chemotherapy, Dr. Seiwart said. Seiwert TY, Haddad RI, Gupta S, et al. Antitumor activity and safety of pembrolizumab in patients (pts) with advanced squamous cell carcinoma of the head and neck (SCCHN): Preliminary results from KEYNOTE-012 expansion cohort. J Clin Oncol. 2015;33:(suppl; abstr LBA6008). 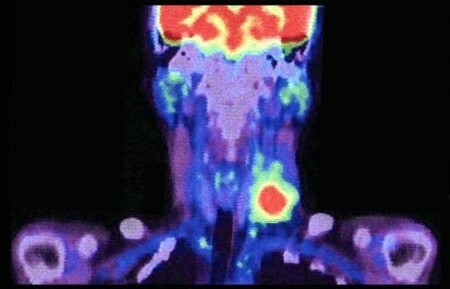 A Merck & Co drug that helps the immune system fight cancer was about twice as effective as the current standard therapy for patients with recurrent or advanced head and neck cancers, according to study data released on Friday. A quarter of the 132 patients who received the drug, Keytruda (pembrolizumab), saw their tumors shrink by at least 30 percent. Fifty-six percent of patients experienced at least some tumor shrinkage in the ongoing single drug Phase I study dubbed Keynote-012, researchers reported. “This is remarkable because we don’t usually see this level of activity with new agents. We have a track record of failure,” said Dr. Tanguy Seiwert, lead investigator of the study from the University of Chicago. Advanced head and neck cancer is currently treated with Eli Lilly’s Erbitux, known chemically as cetuximab, which typically has a response rate of 10 percent to 13 percent. “The only thing that works is cetuximab and this looks at least twice as good,” said Seiwert, who was presenting the Keytruda data at the American Society of Clinical Oncology meeting in Chicago. Merck shares rose more than 1 percent to $60.43 on the New York Stock Exchange. Keytruda and Opdivo from Bristol-Myers Squibb Co are at the forefront of a promising new class of drugs called PD-1 inhibitors that block a mechanism tumors use to evade the immune system. Keytruda is approved to treat advanced melanoma and awaits a decision for use in lung cancer. It is being tested against 30 types of cancer alone and in various combinations. While overall survival data was not yet available, Keytruda and Opdivo have extended survival for some patients in other cancers. The drug appeared to work as well for patients whose cancer tested positive for human papillomavirus as those who were HPV negative. Some older treatments may be less effective in HPV positive patients, researchers said. Keytruda was well tolerated with few side effects, Seiwert said. Serious immune-related side effects, such as inflammation of the lungs or colon, were reported in a very small number of patients in the study. Head and neck cancer is the sixth most common cancer worldwide. Patients with recurrent or metastatic head and neck cancer are usually expected to live about 10 to 12 months. Reporting by Bill Berkrot in New York; Editing by Diane Craft. When Barbara Marder was diagnosed with lung cancer three years ago, she had part of her right lung removed, went through a round of chemotherapy and tried to move on with her life. “I had hoped that everything was fine — that I would not create difficulty for my children, that I would get to see my grandchildren grow up,” says Marder, 73, of Arnold, Md. But a routine scan a year later found bad news: The cancer was back — this time in her other lung. But Marder didn’t give up. She started exploring her options, which eventually brought her to Johns Hopkins in Baltimore, where doctors are testing a new type of cancer treatment known as immunotherapy. “Immunotherapy for cancer means developing treatments to harness your immune system and using your own immune system to fight the cancer,” says Dr. Julie Brahmer, an associate professor of oncology and Marder’s doctor. Scientists have been trying to do this for decades. After all, our immune systems can fight off all kinds of health threats. So, why not cancer? But nothing seemed to really work. “It’s been very frustrating,” Brahmer says. But scientists recently discovered that cancer takes a page from Harry Potter: It puts on a kind of invisibility cloak. “Cancer can keep the immune system from recognizing that it’s bad and keep it from attacking itself,” Brahmer says. Now scientists have found a way around this. “The breakthrough is in therapies called ‘checkpoint inhibitors,’ ” Brahmer says. Checkpoint inhibitors are drugs that pull off cancer’s invisibility cloak by blocking the switch that turns it on. And these drugs seem to be working, at least for some patients — melting away the toughest tumors, such as some melanomas, the deadliest kind of skin cancer. “They seem to be working quite well for multiple different cancers,” Brahmer says, including kidney cancer, bladder cancer, head and neck cancers, lymphoma and even perhaps breast and lung cancers. So Marder volunteered for one of Brahmer’s studies testing a checkpoint inhibitor called nivolumab, or Opdivo, for lung cancer. Within weeks of starting her infusions, the tumors in her left lung began to disappear. “That was very, very exciting. It really changed my perspective. I thought, ‘Jeepers,’ ” Marder says. Checkpoint inhibitors can cause serious side effects when the immune system attacks healthy cells, causing dangerous, even sometimes life-threatening organ damage. But so far that appears to be relatively rare. Most patients just get a little tired. Some, like Marder, get an itchy rash. But compared with traditional chemotherapy, it’s easier in most cases. One big question is, how long will these drugs keep working? Traditional chemotherapy often stops working with time — the length of effectiveness varies depending on the patient, the type of cancer and the stage at which it was diagnosed. But so far checkpoint inhibitors seem to keep going a lot longer, even in patients who have stopped responding to standard chemotherapy. No one knows yet how much longer. But Brahmer says so far it looks promising. “We’re reporting three-year survival rates in [lung cancer] patients who we would say typically should not be around,” Brahmer says. For melanoma, researchers have followed patients for even longer, she says. When Marder went back for a checkup more than a year after starting her treatment, there was still no sign of her cancer. Marder was thrilled. “I’m very fortunate,” she says. But another big question about these drugs is how much they cost: more than $120,000 for each round. That has drawn some intense criticism. The companies that make checkpoint inhibitors defend their price tags and say they will help make sure patients can afford them. “Any patient who needs access to a checkpoint inhibitor made by Bristol-Myers Squibb will have access through a robust patient-assistance program,” says Michael Giordano, who heads oncology drug development at the company. Brahmer hopes doctors will figure out a way to cut the costs and says patients may not have to stay on the drugs indefinitely. That’s because when patients stop taking them, immune system cells known as T-cells seem to remember how to keep the body cancer-free. “We think that over time your immune system creates memory,” Brahmer says. The T-cells remember how to attack the tumor and stop the cancer from putting up a shield. “So those T-cells continually keep that cancer under control. Even without treatment,” Brahmer says. Brahmer might try that for Marder. But for now, she’s coming back every two weeks to receive infusions, and because she is in a study, Marder doesn’t have to pay for the drug. Brahmer knows she and other researchers will have to treat many more patients for a lot longer to really know just how well these checkpoint inhibitors work, and for how long. Many scientists suspect it will take a combination of checkpoint inhibitors to get the most out of our immune systems to fight cancer. NPR’s documentary Cancer: The Emperor of All Maladies will air on PBS in March. Immune cells in the blood primarily defend us against infection. But we’re now learning that these cells can also keep us free from cancer. Patients with less efficient immune systems such as organ transplant recipients or those with untreated HIV, for example, are more susceptible to cancers. It is also becoming increasingly apparent that we can use immune cells to predict survival in people who do develop cancer. And that, in fact, there are immune cells within cancers. The number of immune cells inside a tumor can hugely vary: some patients have vast numbers while some have very few. In a recent study, we showed that in head and neck cancers, the survival of a patient depends on how many immune cells are within the tumor. This could be a valuable way of individualizing cancer treatments. Patients with lots of immune cells, for example, could be offered less toxic cancer treatment while those with few immune cells may need more aggressive treatment to improve their chances of survival. Not all immune cells within the tumor are able to “attack” the cancer. By looking at specific cell markers – proteins on the cell exterior that allow us to see whether, for example, cells are exhausted – we can determine which individual immune cells in the tumor will be effective in tackling the cancer, or if they are exhausted and not able to perform any useful function. It’s possible that these exhausted cells could be reinvigorated to become useful again with targeted immunotherapy treatments currently in development. These include vaccines, so if a cancer has been caused by a virus, we can vaccinate the patient with a short segment of the same virus to encourage the immune system to react to it. Around 30% of head and neck cancers, for example, are the result of human papillomavirus (HPV). There has been a 225% increase in these types of cancers over the past 15-20 years and in the US, HPV will cause more of these cancers than cervical ones. In these cases, cancer cells continue to express part of the HPV on their surface. The hope is that following vaccination, immune cells will be better able to identify these HPV cancer cells and kill them. For people who simply don’t have many immune cells in tumors, specific, targeted immunotherapy could be one option. But also broader “brush stroke” treatments. These broader treatments cover all immunotherapies that encourage a patient’s immune system in a fairly non-specific way. Our immune cells are normally very tightly regulated and include many fail-safe systems to prevent them from over-reacting primarily to infections. General immunotherapy takes the brakes off and allows the immune cells to react to the cancer cells. It may be that a combination of specific vaccine and non-specific immune treatments could be enough in combination to tip the balance in favor of the patient’s immune system so that it is able to overcome the cancer. We’re going to further investigate how immune cells might help us to fight cancer and two head and neck cancer immunotherapy trials are due to start at the University of Southampton in the next six months. Note: This article was originally published on The Conversation. Advaxis, Inc., a leader in developing the next generation of immunotherapies for cancer and infectious diseases, announced that it has submitted an Application for Orphan Drug Designation with the U.S. Food and Drug Administration (FDA) Office of Orphan Products Development (OOPD) for ADXS-HPV, its lead drug candidate, for the treatment of human papillomavirus (HPV)-associated head and neck cancer. There are about 50,000 new cases of head and neck cancer annually, with about 15,000 deaths. HPV infection is estimated to account for 20-50% of current incidence. Orphan Drug Designation is granted to drug therapies intended to treat diseases or conditions that affect fewer than 200,000 people in the United States. Orphan Drug Designation entitles the sponsor to clinical protocol assistance with the FDA, as well as federal grants, tax credits, and a seven year market exclusivity period. Under the Orphan Drug Act (ODA), the FDA may grant orphan designation to a drug or biological product intended to treat a rare disease or condition, which is generally a disease or condition that affects fewer than 200,000 individuals in the United States, or more than 200,000 individuals in the United States and for which there is no reasonable expectation that the cost of developing and making a drug or biological product available in the United States for this type of disease or condition will be recovered from sales of the product. The benefits of orphan drug designation can be substantial and include federal grants, tax credits, and a seven year market exclusivity period once the product is approved, provided that the product is first to market. In order for a sponsor to obtain orphan designation for a drug or biological product, an application must be submitted to OOPD, and the designation approved. The approval of an application for orphan designation is based upon the information submitted by the sponsor. A drug that has obtained orphan designation is said to have “orphan status.” Each designation request must stand on its own merit. Sponsors requesting designation of the same drug for the same indication as a previously designated product must submit their own data in support of their designation request. The approval of an orphan designation request does not alter the standard regulatory requirements and process for obtaining marketing approval. Safety and efficacy of a compound must be established through adequate and well-controlled studies. CEL-SCI Corporation announced today that an interim review of the safety data from its open label, randomized, controlled, pivotal Phase III study of Multikine (Leukocyte Interleukin, Injection) investigational immunotherapy by an Independent Data Monitoring Committee (IDMC) raised no safety concerns. The IDMC also indicated that no safety signals were found that would call into question the benefit/risk of continuing the study. CEL-SCI considers the results of the IDMC review to be important since studies have shown that up to 30% of Phase III trials fail due to safety considerations and the IDMC’s safety findings from this interim review were similar to those reported by investigators during CEL-SCI’s Phase I-II trials. Ultimately, the decision as to whether a drug is safe is made by the FDA based on an assessment of all of the data from a trial. IDMCs are committees commonly used by sponsors of clinical trials to protect the interests of the patients in ongoing trials especially when the trials involve patients with life threatening diseases, and when, as in cancer clinical trials, they extend over long periods of time (3-5 years). The committee’s membership should include physicians and clinical trial scientists knowledgeable in the appropriate disciplines, including statistics. The CEL-SCI IDMC includes prominent physicians and scientists from major institutions in the USA and abroad who are key opinion leaders in head and neck cancer and who are knowledgeable in all of the disciplines related to CEL-SCI’s study, including statistics. The Multikine Phase III study is enrolling patients with advanced primary, not yet treated, head and neck cancer on 3 continents around the world. The objective of the study is to demonstrate a statistically significant 10% improvement in overall survival of enrolled patients who are treated with Multikine plus Standard of Care (SOC) vs. subjects who are treated with SOC only. The universally accepted current standard of care for the patient population being enrolled in the CEL-SCI study is surgery plus radiation or surgery plus concurrent radiation and chemotherapy, dependent on the risk factors for recurrence found after surgery. Multikine treated patients receive 15 local injections of Multikine over a 3 week period prior to standard of care treatment. Multikine injections are administered in the area around the tumor and in the area of the adjacent lymphnodes since those two areas are where the tumor is most likely to recur. Multikine is intended to create an anti-tumor immune response to reduce local / regional tumor recurrence and thereby increase the survival of these patients. Multikine is the first immunotherapeutic agent being developed as a potential first-line treatment for advanced primary head and neck cancer. If it were to be approved for use following completion of our clinical development program, Multikine would become an additional and different kind of therapy in the fight against cancer: one that employs our body’s natural ability to fight tumors. Advaxis is announcing the enrollment of patients into the REALISTIC Phase I/II trial sponsored by Cancer Research UK to evaluate ADXS-HPV for the treatment of HPV-positive head and neck cancer. HPV has been linked to as many as seventy percent of all head and neck cancers. ADXS-HPV is a next-generation immunotherapy that acts as a therapeutic vaccine and is being tested in trials against HPV-associated diseases, including cervical cancers. Cancer Research UK assumes all patient costs. Advaxis seeks to recruit 45 patients. The REALISTIC trial is being carried out at the Aintree Hospital at the University of Liverpool, the Royal Marsden Hospital at the University of London, and the Cardiff Hospital at the University of Wales. Qualified patients will have already received treatment for head and neck cancer, either surgery, radiotherapy, chemotherapy, or a combination of treatments. Head and neck cancers account for roughly three percent of all cancers in the US, according to the American Cancer Society. They are more commonly diagnosed in men than women, and while they are traditionally linked to smoking and to alcohol consumption, HPV-related oropharyngeal cancers are on the rise among white males under 50 years of age.